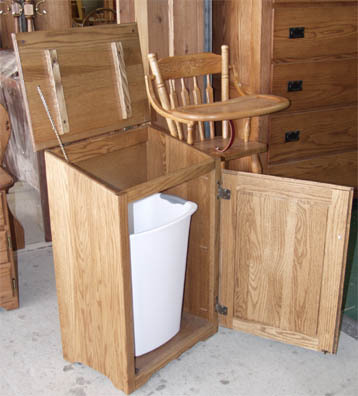 This photo illustrates the inside of our new Amish made solid oak trash can. You can see that both the top open and the front door for easy access. The top is restrained from opening too far by a sturdy brass chain. Please note that you must supply your own trash container for the inside - the one shown is for illustration purposes only.